In earlier times Brimsmore Tree was a boundary mark for the Parish Perambulation. Now long gone, the tree gave name to the general area of the crossroads, the farm and the field, parcel 1410, in question here. The roughly triangular field is bounded to the north by Thorne Lane, to the west by Tintinhull Road and to the east originally by the field called Oxen Furlong (1408) but today by the A37. The 1589 Terrier in referring to the boundaries of the 'Middle Field at Kingstone' states "From Marshweeche to Brimsmore Tree and from thence to Picked Weech.... Ashley from Brimsmore Tree up to Snelling Cross near the Windmill and from thence to Torne Way and from Thorne Way to the said Brimsmore Tree". 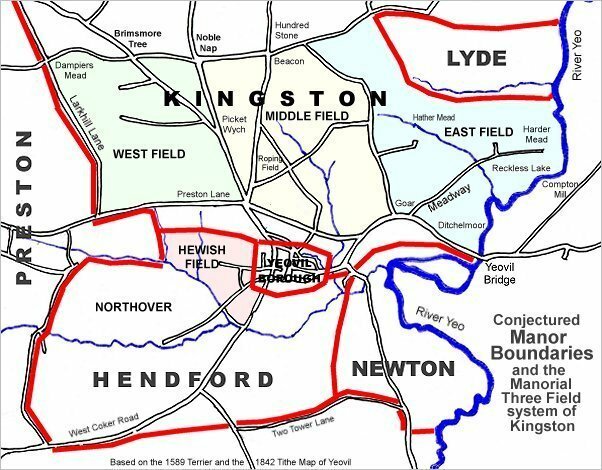 The 1589 Terrier in referring to the boundaries of the great West Field states "19ac are meadow lying at Brimsmore in Dampiers Meadow and Andrews Meadow, the rest arable lying in Guardons Close at Brimsmore.... In the Field in the same Furlong to Gold Thorne 3ac all bounding upon Brimsmore Moor 6ac lying together bounding upon William King's close next to Brimsmore Way...."
The 1753-1810 Minute Book of the Turnpike Commissioners, under the heading 'The Turnpike Road belonging to Yeovil' noted "From Brimsmore Tree to the Cross Road leading to Thorne, 3f 16p." while the 1832 Register of Voters noted Joseph Brook, Brimsmore Tree in this parish; Occupier of Brimsmore Tree Farm. 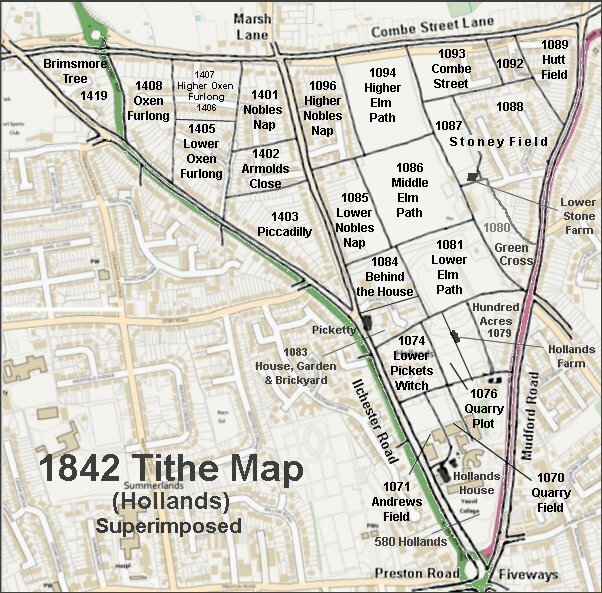 The 1842 Tithe Map and the 1846 Tithe Award refer to Parcel 1358 Brimsmoor Tree Gound, 1388 etc Brimsmoor Tree Farm, House, Garden and Orchard; 1410 Brimsmoor Tree. Today the former field known as Brimsmore Tree is completely filled with housing in culs-de-sac off Tintinhull Road. The Hollands area reproduced from the 1842 Tithe Map. Brimsmore Tree is at top left. 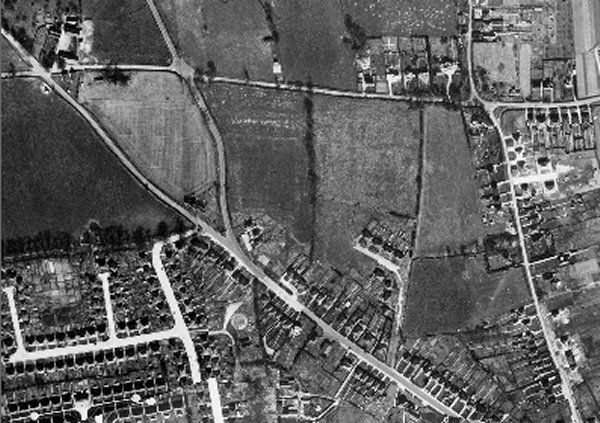 The 1946 aerial photograph showing Brimsmore Tree as the lighter field at top left.